Fayetteville police are searching for the man who forced entry into the Walgreens pharmacy on March 12 and made off with a trash bag full of Newport cigarettes. Photo/Fayetteville Police Department. Fayetteville police are interesting in locating the man who forcibly entered the Walgreens pharmacy on South Glynn Street on March 12 and made off with a trash bag full of cigarettes. 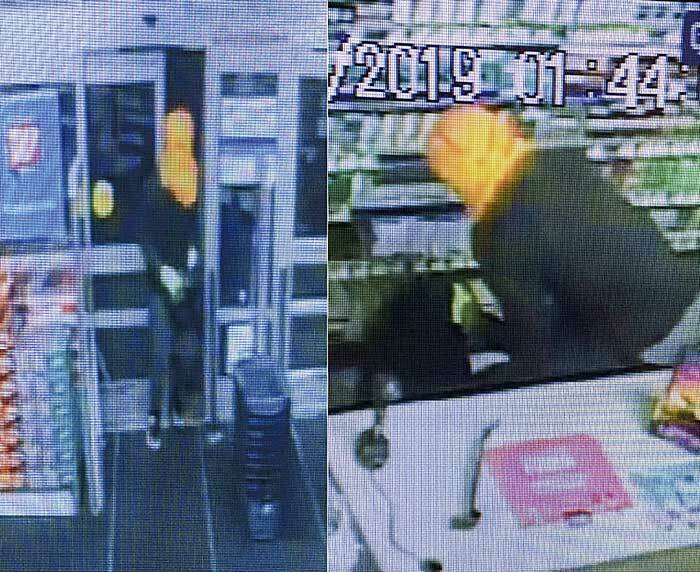 Fayetteville Police Department spokesman Jeff Harris said the break-in at the pharmacy occurred on March 12 at approximately 1:45 a.m. Harris said the man was able to pry open the front door and left after filling a trash bag with Newport cigarettes. Harris said the man was described as a black male wearing gray sweatpants, a dark gray sweatshirt, a red shirt and yellow gloves. In unincorporated Fayette County, the theft of a motorcycle from an unlocked storage shed at a residence on Hillcrest Avenue off Milam Road was reported on March 10, said Sheriff Barry Babb. In Tyrone, a burglary reported on March 9 involved one or more persons entering a shed on Castlewood Road by removing the door frame and stealing items such as a mower and leaf blower, said Tyrone Police Department spokesman Philip Nelson.